One of the big problems in San Diego is the freeway-style ramps that have been designed to allow maximum efficiency to motor vehicles at the cost of bicycle, pedestrian and other vulnerable user's lives. For example, trying to ride on Friars Road with the multiple on-ramps and off-ramps can feel humiliating given how little consideration has been made for the non-motorized populace. But the sort of changes needed to be made in order to transform our transportation network can come in a variety of different ways and the example below is an example of how paint can make a visually arresting difference. Who: City, County and Caltrans staff have been invited along with bike advocates and other related stakeholders. You are also invited. What: Joe Gilpin, Alta Planning + Design’s expert on innovative bikeway treatments and primary author of the NACTO (National Association of City Transportation Officials) Urban Bikeway Design Guide, will be at SANDAG to give a 90 minute overview presentation on the NACTO Urban Bikeway Design Guide. After the recent deaths of two bicycle riders, there has been a lot of attention highlighting the dangerous design of San Diego's streets - an environment that encourages speeding and is uninviting to anyone both outside a car and inside, given how many drivers die or cause injury or death on a weekly basis. Joe Gilpin, a planner with the bicycle and pedestrian design firm, Alta Planning & Design, will be in San Diego next Tuesday to give an overview on the NACTO Urban Bikeway Design Guide. Released in the 2011, the NACTO Urban Bikeway Design Guide provides the first comprehensive design guidance for the American context on a wide-range of innovative and increasingly popular bicycle treatments (e.g., cycle tracks, bike boxes, bike signals). As cities across the United States work to expand the appeal and safety of cycling in urban areas, they are successfully using a new toolbox of innovative design and engineering strategies. The NACTO Guide draws on the experiences of these pioneer cities and adapts internationally recognized best practices to the American context. What is the NACTO Urban Bikeway Design Guide? NACTO is an association of 15 major U.S. cities formed to exchange transportation ideas, insights, and practices and cooperatively approach national transportation issues. The NACTO Urban Bikeway Design Guide is a set of design standards for bikeways and was released with much fanfare last March. Janette Sadik-Khan, the current Commissioner at the New York City Department of Transportation is responsible for much of the positive transformation of New York City - all made with acknowledging the reality that New York City has to accommodate a continually growing population, unveiled the guide last year. Below is a video of the official announcement. As Mia Birk, from Alta Planning & Design, states "NACTO undertook the project because many of its members found existing design manuals inadequate for their efforts to promote bicycle transportation." In California, planners and engineers are compelled to follow the Manual on Uniform Traffic Control Devices (MUTCD), The American Association of State Highway and Transportation Officials’ (AASHTO) Policy on Geometric Design of Highways and Streets (the “Green Book”), the California Highway Design Manual, and other highway-centric design guidelines when designing facilities that are used by all users traveling in a variety of transportation modes besides an automobile. The NACTO Urban Bikeway Design Guide allows for additional flexibility when transportation engineers, planners and the like are re-designing our roads to be more inviting to all its users. Giving Gilpin an opportunity to talk about the Urban Bikeway Guide is an excellent first step that SANDAG is taking to acknowledge the glaring deficiencies in our transportation network. I hope the presentation compels all cities in the county to sign on to be member of NACTO and implement the best practices that can have tremendous economic and health impacts on a community. For more on Alta Planning & Design, read this interview profiling Sam Corbett, the Senior Associate at San Diego's Alta Planning & Design branch. San Diego, CA- Local San Diego cyclists are organizing an advocacy ride in memory of David Ortiz, a local cyclist who was killed while lawfully riding his bike on his way to work last week. The death of David Ortiz highlights the quintessential problems faced by San Diego cyclists on a daily basis: inattentive drivers, poorly designed roadway infrastructure, and a societal mindset that cyclists always ride recklessly. Contrary to initial information provided by the San Diego Police Department, Mr. Ortiz was riding in the same direction of traffic, was properly positioned on the roadway, was wearing a helmet, and one of the motorists appears to have fled the scene prior to police arrival. The ride will take place Wednesday, April 4, 2012 at 4pm. The ride will begin at the fountain in Balboa Park and conclude at 202 C Street. in front of the City Administration Building. At the conclusion of the ride, cyclists will lay down on the ground with their bikes to represent the thousands of cyclists and pedestrians struck by motor vehicles every year in San Diego. The latest statistics from San Diego County’s health and human services agency and emergency medical services indicate that 997 cyclists were either killed or injured while riding their bikes and 1,054 pedestrians were either killed or injured while walking the streets of San Diego in 2009. These numbers are quite high compared to other cities around the world. Paris, France, for example, did not have a single cycling death in the year 2011. 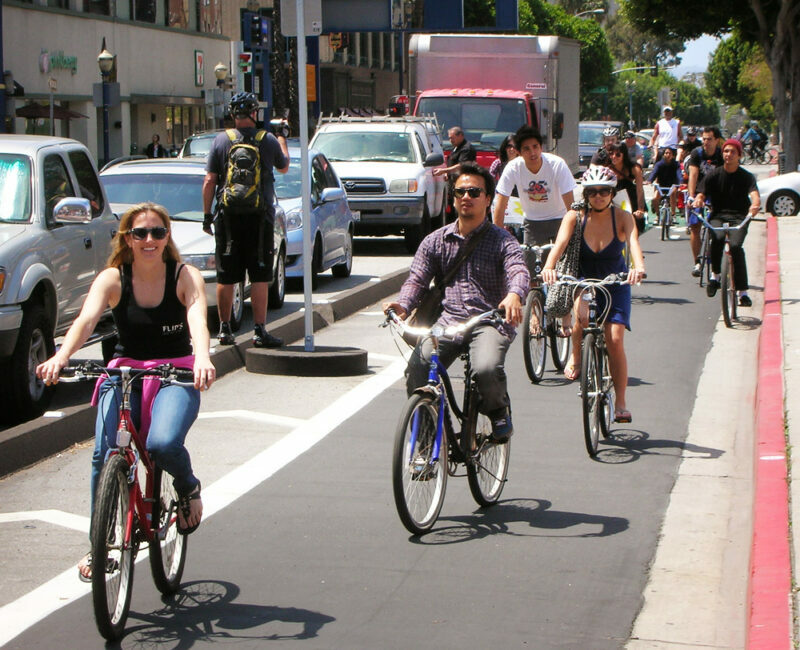 San Diegans deserve significantly better bicycle infrastructure. Too often cyclists are left to ride in narrow, poorly designed bike lanes filled with debris, potholes, and other hazards. A police department that lacks both the will and the resources to make traffic enforcement a stronger priority further complicates these issues. Those who choose to commute to work or school by bicycle should not have to risk their life for their commitment to healthy lives, a sustainable city, and a more livable urban environment. Today America faces a significant number of issues: an obesity epidemic, a clean air problem, increasing deaths from motor vehicle collisions, crumbling roadway infrastructure, a diabetes epidemic, dependence on foreign oil, and climate change. All of these issues can be seriously mitigated by a stronger commitment to safer bicycle infrastructure in San Diego and other US cities. We are calling on the city to immediately adopt guidelines developed by the National Association of City Transportation Officials (NACTO). These progressive bicycle infrastructure designs strongly contribute to both perceived and actual safety for the cyclists using them. It is our hope that publicity about this event will remind motorists that cyclists are your neighbors, co-workers, doctors, teachers, firefighters, programmers, and dentists. Most importantly, cyclists are humans, not an object on two-wheels. For more on the story, read Ted Roger's post on this. Hi Timur, I wanted to contact you and Sam Ollinger and tell you know that I really appreciate what you are doing. David was my brother. In many ways, his passing makes me feel helpless, but the event you are organizing makes it so that his passing is not in vain. I live in New York, but I would like to participate in your event. 1) A public apology from the police department to the victim's family & the cycling community for jumping to conclusions and immediately blaming the cyclist before fully completing the investigation.